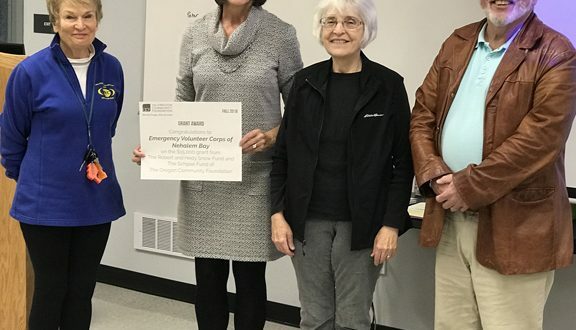 The Oregon Community Foundation has awarded a $15,000 grant to the Emergency Volunteer Corps of Nehalem Bay to help develop an emergency food supply plan that would come to the aid of residents and visitors in north Tillamook County following a major disaster. The grant was presented Nov. 26 at the Corps’ board meeting in Nehalem. The worst-case local disaster – a Cascadia Subduction Zone 9-Point-Plus earthquake, followed by a devastating tsunami – could be expected to destroy roads, bridges and utilities, blockhighways, and isolate the area from outside help for weeks. To provide for survivors, the plan envisions local governments having stored food supplies in advance sufficient to last for at least 21 days, until emergency supplies could be brought in — by air, sea or reconstructed highways. The plan will also include guidance for local households capable of doing so to store their own water, food and other supplies, for use while they shelter in their homes. Everybody else – residents whose homes were destroyed, tourists, and those passing by when the disaster struck – would be expected to gather in shelters or temporary encampments throughout the area. Low-income residents unable to stockpile their own food will also need help. Having a mass-feeding plan thought out, with provisions stored in appropriate places, will be critical to survival and recovery. According to a 2017 strategic plan, the only highway routes the Oregon Department of Transportation (ODOT) could hope to eventually get open to the north Oregon coast following a major disaster – after dealing with landslides and bridge failures — would be Highway 30 to Astoria, and Highway 18 to Lincoln City. The area between those highways, Tillamook and Clatsop Counties, would be unable to be resupplied by road for weeks or months. The $15,000 OCF grant will be used to find and hire an emergency food consultant who will prepare plans for mass care feeding and individual household food preparedness. Included will be recommendations for the types of food to acquire, nutritional considerations, food storage, stock rotation, distribution and preparation, waste disposal, and food safety. Informational brochures will be printed in English and Spanish. EVCNB’s Mass Care budget, which is funded by donations and fundraising, will pay for copies of the plan to be distributed to all interested parties, including cities, special districts, county, and state emergency management offices. According to its website, the EVCNB is “dedicated to building community and regional resilience, developing programs to ensure readiness, and creating a culture of emergency preparedness.” The organization focuses its work in the Nehalem Bay region, with outreach and support to all of Tillamook County. In recent years, the 10-year-old organization has become a research and development organization, studying problems involved with emergency preparedness and finding solutions that would work in a rural, coastal area such as north Tillamook County. Their findings and recommendations are then turned over to local city and other government agencies, which would be responsible for responding to a local disaster. Kozlowski said the grant application included letters of support from the Emergency Preparedness Forum and the Tillamook County Citizen Corps Council, the Oregon Food Bank, CARE, Tillamook County Emergency Management, the cities of Manzanita, Nehalem and Wheeler, the Tillamook County Commissioners, Nehalem Bay Wastewater Agency, two local water districts, Nehalem Bay Fire and Rescue, and the Oregon State Resilience Officer.